“Let It Go,” Idina Menzel’s Frozen ballad: It sends the wrong message. My daughter loves Frozen, but that weird come-hither makeover in its show-stopping ballad leaves me very cold. Frozen is a lovable movie—except for one regrettable element. I first encountered the Disney musical Frozen not as a critic—(it was Dan Kois who reviewed it, somewhat lukewarmly, for Slate)—but as the parent of a fan. As a result, my love for the movie—and I do love it—is by now hopelessly bound up with my daughter’s love for it, and mine for her. P. is usually the cinematic equivalent of a picky eater, happy to stick to her longtime favorites night after night, slow to agree to try something new. And as she will clarify at length on request, she is neither a “girly girl” nor “into princesses,” so my description of the story (loosely inspired by Hans Christian Andersen’s The Snow Queen, it involves not one but two orphaned princesses) didn’t pique her interest. But the second grade was pretty seriously abuzz about Frozen the week after its Thanksgiving opening, so she agreed to give it a try. Before I had time to sort through my own response to Frozen, I was being conscripted to play one (or several) of its characters in an ongoing pretend game, then to search YouTube for versions of the movie’s songs with lyrics included so she could learn the words and sing along. Something about this movie, and in particular its music, had immediately seized my girl’s imagination—and that of a lot of other kids, it seems. 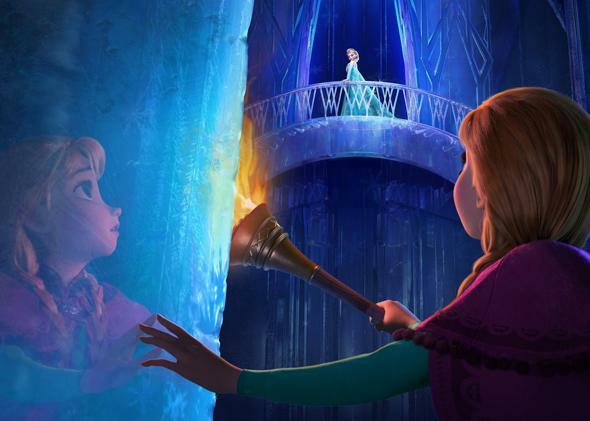 Since its release, the Frozen soundtrack has been steadily demolishing both sales records—it’s spent longer at the No. 1 spot on the Billboard charts than any film soundtrack since 2003—and parents’ eardrums. Even those of us who, like me, are partial to the movie and its music have by now heard our fill of group-belted renditions of “Let It Go,” the big, show-stopping end-of-act-two diva ballad sung by Idina Menzel as the self-exiled ice princess Elsa. Now that Frozen is nominated for a Best Animated Feature Oscar—with “Let It Go” looking like a front-runner for Best Original Song—I’m moved to relate a conversation I’ve had at separate times with a few other mothers, in the rushed, barely audible way mothers carry on conversations while their daughters (and sometimes sons) belt songs from Frozen in the background. After establishing that we both like the movie—the drama of the two sisters divided, the comic-relief snowman who can’t wait for summer, the satisfyingly feminist twist at the end—one or the other of us will say: “But isn’t there a moment in ‘Let It Go’ that kind of bugs you?” And the other one will know right away what she means. To get at what I mean, you need a little background about the setup to the climactic number. So Elsa, the elder of the two princess sisters, was born with the power to turn everything she touches to ice—but not with the ability to control this power, which has meant spending most of her life locked away from the rest of the world. On the night she is to be crowned Queen of Arendelle, Elsa has a fight with her impetuous younger sister, Anna (voiced by Kristen Bell), loses control of her emotions, and inadvertently sets off an eternal winter throughout the kingdom. Overcome with shame and unsure how to reverse the damage, Elsa flees to the mountains—and there undergoes the kind of transformation that only a pop diva can, letting loose with the empowerment anthem “Let It Go” as she dares to own, for the first time, her fabulous frozenness. Even the umpteenth time through (and even though, in plot terms, this is the moment when she is basically assuming the role of villain), it’s impossible not to thrill to Elsa’s surging sense of power as she throws off the gloves the late king always made her wear to hide her natural gifts and casts them into the raging storm. “It’s time to see what I can do/ To test the limits and break through,” she sings as she experiments with her long-suppressed talents, culminating in the telekinetic construction of an ice bridge leading to an immense ice palace where she plans, henceforth, to dwell in queenly isolation. At the song’s emotional climax, as Elsa is about to see the sun rise for the first time from the balcony of her new crystal palace, she suddenly sees fit to express her freshly unleashed power by giving herself … a magical makeover. “Let it go/ Let it go/ That perfect girl is gone,” she declares as she ditches her old look (a modest dark-green dress and purple cloak, hair in a neatly tucked-up braid) for one that’s arguably even more “perfect.” By the time she sashays out onto that balcony to greet the dawn, Elsa is clad in a slinky, slit-to-the-thigh dress with a transparent snowflake-patterned train and a pair of silver-white high heels, her braid shaken loose and switched over one shoulder in what’s subtly, but unmistakably, a gesture of come-hither bad-girl seduction. Now. I am not saying that all movies for children should be ideologically scrubbed clean of any hint of sexuality. Nor am I immune to the fantasy—one that’s surely not limited only to women—of vanquishing one’s demons and tapping one’s reserves of inner courage while also looking like a million bucks. But I know I’m not the only one who feels a familiar sense of deflation every time that pulse-racing song (delivered so gloriously by Menzel) culminates in a vision of female self-actualization as narrow and horizon-diminishing as a makeover. It’s a moment I recognize from too many movies in my own childhood—Grease was one, The Breakfast Club another—in which the “good girl” goes over to “the bad side” thanks to a quick cosmetic fix-up (Olivia Newton-John’s big slutty perm and skintight black pants! Ally Sheedy’s tragic de-Goth-ification at the hands of Molly Ringwald!). These moments always bugged me as a kid, because they seemed to be last-minute reversals of the foregoing movie’s message, which was that the character in question (Newton-John’s virginal Sandy, Sheedy’s glumly eccentric Allison) was fine just the way she was. To be sure, Elsa’s conversion into a glammed-out ice diva does differ in important ways from those earlier onscreen makeovers—for one thing, her transformation isn’t meant to impress any specific suitor, and in fact Elsa (unlike her younger sister, Anna) ends the movie without a romantic prospect on the horizon. If you can’t tell, I’ve put a good deal of thought into this five-to-10-second section at the end of a soaring pop ballad in a popular children’s movie. I love thrilling to Elsa’s race up the ice bridge with my daughter, in large part because I love to imagine her feeling that way one day herself: in control of her own ever-growing powers, able to create vast structures she never imagined, at “one with the wind and sky.” But every time that last verse rolls around—the shimmy into the ice dress, the sassy flip of the braid over the shoulder—I hope that when she grows up she remembers the magic, not the makeover.